On my first day on a trip to Washington, D.C., I had an awakening. A group of women in a hallway in the House of Representatives caught my eye. They were colorfully dressed and quite enthusiastic. When I asked one of them why they were there, she told me that they were spreading the word that a woman needs to be at home because a child needs to be with their mother and child care settings are harmful. Before that moment, I had never encountered a whole group of women who did not believe that quality early care and education, or ECE, is a good thing. As Director of Strategic Partnerships for First 5 LA, I was tempted to engage her in a conversation on the benefits of ECE. But I wasn’t there to challenge her assumptions. I was there to share these benefits with the people who make the decisions that affect young children, working families and businesses: the lawmakers. As a member of the First 5 LA team joining the Los Angeles Area Chamber of Commerce ACCESS Washington, D.C. advocacy trip from March 11–13, I was part of a bipartisan delegation of 150 business and civic leaders meeting with federal lawmakers on issues ranging from transportation and health care to immigration and education. These issues are vital to the business community to create a bolder future for our region and the entire nation. One of the keys to that future is accessible quality early care and education for today’s workforce, which will ensure the development of tomorrow’s workforce capable of competing in a global economy. I rinsed the unsavory taste of the hallway encounter from my mouth with a drink of water and marched into a meeting with U.S. Congresswoman Zoe Lofgren (D-San Jose). After opening remarks at the meeting by Maria Salinas, the first Latina CEO of the Chamber, the baton was passed to me. The moment I said that investing in young children builds a strong economy, Lofgren’s face lit up. The Congresswoman talked enthusiastically about being a working mom who relied on child care in the past. Today, her now-adult son benefits from great child care as well, as an employee at Google. She talked about her ongoing commitment to Head Start and the Child Care and Development Block Grant. So too did House Speaker Nancy Pelosi’s staff become engaged when I started talking about children. They recalled Pelosi’s joy in having her grandchildren join her at her swearing-in ceremony and were grateful when I offered First 5 LA as a resource they can call on. Throughout the two days of meetings with lawmakers to cover a wide range of issues vital to the L.A. business community, the power of partnership between First 5 LA and the Chamber packed a one-two punch when it came to early education. The Chamber’s Education and Workforce Development Council, Cradle to Career agenda and alignment with a number of First 5 LA’s early learning priorities, such as a countywide Kindergarten Readiness Assessment, are just a few notable examples. The economic cost of the childcare crisis on working parents, employers and taxpayers is calculated to be an annual $57 billion in lost earnings, productivity and revenue. Among businesses that invest in child-care options for workers, 85 percent report improved employee recruitment and nearly two out of three report decreased turnover. Public investment in affordable, quality child care increases both the ability of parents to work and the amount of tax revenues collected, thus resulting in lower government spending over the long term. Attending a quality early learning program is profoundly beneficial for young children, fostering healthy development, increasing thinking and social skills, and improving success in school and throughout life. The wave of excitement around the record number of newly elected congresswomen only buoyed our messaging. 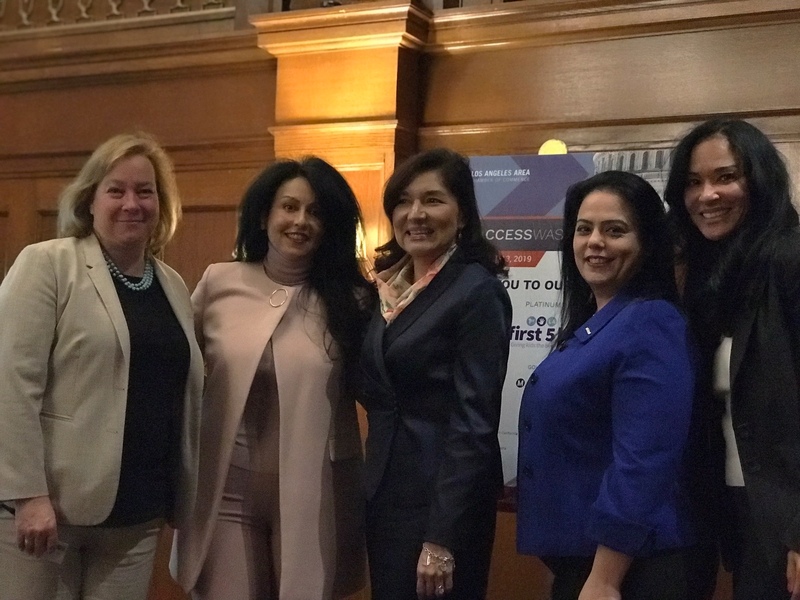 This was further elevated by the many powerful female voices on the ACCESS D.C. trip, including local leaders such as Los Angeles Unified School Board member Mónica Garcia and L.A. City Councilwoman Nury Martinez. Additionally, thanks to the influence of Chamber Board Chair Jerry Neuman, the ACCESS D.C. agenda included immigration data and the need to have supportive policies that ensure a fair, comprehensive 2020 Census count, which can help ensure that children and families receive their fair share of funding for services. One of the many highlights for me was introducing Senator Dianne Feinstein as our keynote speaker during the delegation breakfast. During the introduction, I was able to share that Senator Feinstein has an impressive record advocating for what is important to our children and families in California and the nation. Her policy priorities have included improving investments in education, promoting strong families (including her leadership on immigration), a fair and accurate Census, and protecting young children from violence, with a strong track record on gun reform. 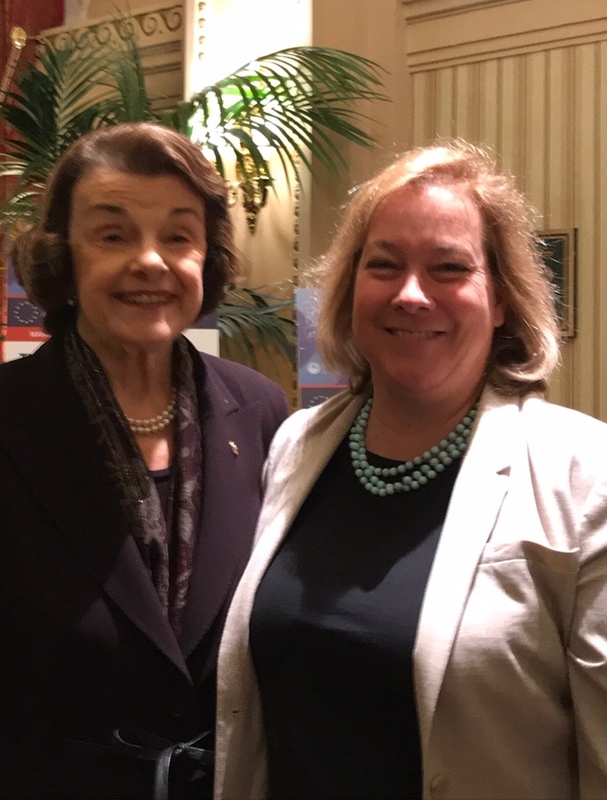 Senator Feinstein talked about her three priorities today: fire, water and infrastructure, all topics of interest to the ACCESS D.C. gathering and aligned with First 5 LA’s Built Environment work in improving access to green space, creating safer streets and ensuring clean water for children and families. In the end, I left our nation’s capital with a powerful message of my own: while there are some women who may not see things as I do when it comes to the benefits of child care or early education, there are other women who are working hard in Washington, D.C. every day to ensure that California’s youngest children (and their parents) receive the child care and early learning they need for the best start in life — and beyond.